Aids-drugs-online.com started its operation on 2005. The store was incepted to help patients suffering from AIDS and HIV to deal with the rising cost of their medications. Aids-drugs-online.com aimed to help consumers with the disease afford the AIDS and HIV medications since these drugs are too expensive, especially for the long-term management of the disease. According to Aids Drugs Online, its aim is to connect patients to suppliers of low-cost generic versions of the existing expensive AIDS medications so that patients can save money without having to forgo taking the meds they need. Aids-drugs-online.com did not indicate where it operates from, so it is a mystery where this store is based. 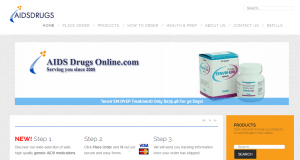 As for the product offerings of Aids Drugs Online, the shop has products such as Tenvir EM, Zepdon, and Tanvin EM. Besides the famed AIDS treatments, Aids-drugs-online.com also caters to patients with other health concerns such as skin and acne, Parkinson’s disease, men’s health, liver and gall stones, hormone problems, herpes, and other medical conditions. The shop offers to dispense the products available on its store whenever prescriptions are presented for the products. Aids-drugs-online.com also warns consumers about online pharmacies which do not require the provision of prescriptions. Because Aids Drugs Online has men’s health products available, I checked the available products to see if its prices are also as affordable as other online pharmacy prices for the products. There are only a few choices for the medications available on Aids-drugs-online.com, and they include Apcalis SX, Assurans, Cipvar, Silagra, Tadacip, and several other products. Most of the men’s health meds on Aids-drugs-online.com are from Indian manufacturers, and the store does not sell brand-name products for impotence. Silagra 100 mg from Cipla, one of the multitudes of generic alternatives for Viagra, costs $49.16 for 16 tablets. On the other hand, Tadacip 20 mg from the same manufacturer, Cipla, and one of the generic alternatives to Cialis costs $77.51 for 16 tablets. You can order these meds online or via fax or email. Standard shipping on Aids-drugs-online.com costs $15 per order. As for payments, you can pay for your orders on Aids-drugs-online.com using your VISA and MasterCard credit cards. In case you aren’t able to receive your order 28 days after Aids-drugs-online.com issued you a tracking number, you can reach the shop using its contact details and the store will gladly re-send the orders at the shop’s expense. The store doesn’t mind if you are able to receive both orders. Third-party website comments are unavailable for Aids Drugs Online, but the shop has a testimonials section with several “buyer” reviews posted for its service. According to J. Peterfield from Houston, he was able to receive his order and was glad to receive his orders rather quickly. W. Gonzales, from New York, posted his comment to share that he was incredibly happy that he found Aids-drugs-online.com, a trustworthy shop for his medical needs. On the other hand, P. Broadman, a client from Australia, mentioned that his doctor was the one who recommended Aids-drugs-online.com. Although the comments for Aids-drugs-online.com were all good, these testimonials can’t be relied upon due to their on-site nature. Comments found natively on online stores may merely be fabricated, especially those without verifiable information such as dates and user accounts. Although Aids-drugs-online.com claims to run since 2005, the store does not have available reviews for its service. To evaluate this domain further, I tried using several services such as Scamner and Scam Adviser. The overall score for Aids-drugs-online.com from Scamner.com is 22% out of 100 because according to a more detail account for the store, Aids Drugs Online does not own an SSL certificate, which leaves the buyers’ details compromised. Aids-drugs-online.com was also identified to have very few visitors and that the shop’s domain registry is bound to expire within a few months. On the other hand, Aids Drugs Online was given a score of 42% out of 100 by Scam Adviser. The shop’s age was identified as 13 years and Scam Adviser was unable to discover the shop’s current location because its owner is using a web service to hide its identity. Aids-drugs-online was also determined to have a malware report from its former clients and fortunately, the shop was not yet listed as a “rogue” online pharmacy. However, Aids-drugs-online.com was identified as a threat listed store by Scam Adviser due to the concerns identified for its domain. Aids Drugs Online is offering free shipping for all orders exceeding the $500 mark. Although the store states that buyers can save up to 90% on choosing generics, there are no fixed discounts for the store’s products. Unlike in other online pharmacies, the store does not offer free pills, coupon codes, and returning buyer discounts. Also, I think that the shop’s free shipping offer has a high quota, higher than the offers made by other online pharmacies. Aids-drugs-online.com is a peculiar store since it offers primarily products for HIV and AIDS, and not many online pharmacies are offering HIV/AIDS medications as their primary products. The shop’s aim to mitigate the cost of Rx medications for AIDS patients is really admirable, and the shop’s prices are indeed affordable. However, although the shop is unique and with good prices for its meds, it failed in terms of reviews—the shop failed to garner valid reviews for its service, from reliable online platforms. Because of this, I can rate the store 2 out of 5. Directpharmacyonline.com review – The Ebay of Online Medicines! 6 years ago | No Comments on Directpharmacyonline.com review – The Ebay of Online Medicines!